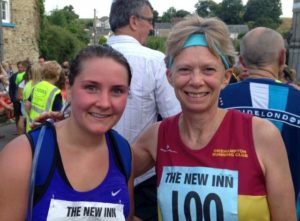 Nicola Smith and Lora Medland took part in their first marathon last weekend. Having never run the distance before, and not being very comfortable with trail running, they still chose to run the off road Bad Cow Marathon in Dorset as their first. This event, organised by White Star Running, is one of their Weekender events with options of different length races over two days, and is held on the fields and heathland of Holton Heath Nature Reserve near Poole. Just to add to the challenge, Nicola and Lora chose to run the 10k race the evening before the marathon, which they completed in 1.04.45 in very windy conditions. Both races were a series of 5k loops and they regarded the 10k as a chance to get used to the terrain and prepare their legs for the marathon the next day. After two laps the evening before and eight for the marathon they decided they were perhaps a bit over-familiar with the route! With great determination and fuelled by jelly babies and Coke, they completed the marathon together in a very respectable 5hr 21min 11sec. Christine Fritsch was also running a challenging race on the more familiar terrain of Dartmoor on Sunday. This was the second running of the Dartmoor Volcano Race, organised by pureTRAIL Running, a 10.25 mile race with over 500 metres of ascent, taking the runners over the highest point in the south moors, Ryders Hill. Starting in Scorriton, the first three miles were all uphill with the runners taking in The Volcano, a pyramid of a spoil-heap from the disused Red Lake china clay works which made for a stunning focal point for the race, at mile six. In wet, misty conditions Christine loved the boggy, hilly terrain, finishing in 2hrs 6min 12sec. Saturday saw our second race in the summer series, the Great West Fell Race. With 13 runners ORC was well represented and first ORC home was Rob Hicks, winner of the Cosdon Hill Race three weeks earlier, who had another brilliant run, finishing in 38.47, and coming second to a very sharp Peter Devonport of Bude Rats. Katie Littlejohns won the First Lady with a terrific run in 52.22 with Lucy Skye coming third in 56.31. Other ORC times; Hugh Robinson; 46.33, Greg Millar; 55.18, Jason Ewing; 56.17, Charlotte Collyer; (1st FV40)1.00.26, Andy Collyer; 1.00.27, Hannah Ramsey; 1.01.55, Christine Fritsch; 1.05.22,Danielle Fullford-Brown; (1st FV50)1.08.29, Sarah Haigh; 1.14.112. Unfortunately Andy Vallance had to retire after pulling a calf muscle on the descent from High Willhays. Several ORCs saved their legs to run the Totnes 10k the next day. This multi-terrain race was described as flatish with one hill, but but in reality this was a tough 10k with an undulating course, a couple of steep hills following twisting paths through fields, woodland and riverbank trails. Roger Voaden was the first ORC home in a very good time of 40.39 to take the 2nd MV50 prize. 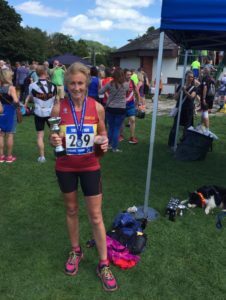 Jane Jackson was the first of the two ORC ladies finishing in 54.14, to claim 1st FV60 and just 2 seconds short of the FV60 course record with its £25 prize! 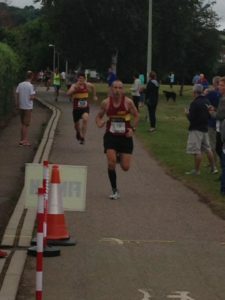 Other ORC times; Robert Kelly; 41.42, Chris Turner; 42.47, Paul Carter; 44.00, Nick Seccombe; 46.23, Mags Jarvis; 1.02.09. 1st FV60 – Congratulations Jane! Error: Error validating access token: Session has expired on Saturday, 20-Apr-19 03:20:42 PDT. The current time is Monday, 22-Apr-19 11:03:10 PDT.